LAMINATE: PRACTICAL, BEAUTIFUL AND MADE TO ENDURE! Looking for a beautiful floor that is both practical and durable? Carpetright is the place for you! At Carpetright we offer a variety of laminate flooring to fit your taste and your budget! Not only does laminate give your home that amazing wooden floor look, it is also very easy to maintain. Visit us and choose from our wide collection of designs and textures. For the perfect finishing touches, we also offer you all the essentials such as skirting, beading, matching finishing profiles and underlay. Everything you need for an amazing floor. Also, we care about the environment. Therefore most of our laminate is made using wood from sustainable forests. 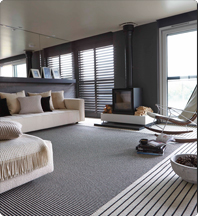 When looking for the perfect laminate floor, your first step is Carpetright. A beautiful collection of modern oak laminate flooring designs for a sleek and stunning finish. This hardwearing range is resistant to burns, fading and general wear and tear so use it not only in your bedroom, but your hall, lounge, dining room and kitchen too. It comes with 4 sided V groove edges and register embossing for a realistic finish. Also, its 8mm thickness helps it withstand busy family life while its 15 year warranty further proves its durability. This durable wood effect laminate offers the beauty of an embossed, natural finish with the practicality of fade, burn and scratch resistance. It has 8mm thickness that creates an authentic sound in your home whilst the oak laminate’s 4 V groove edging provides you with a realistic plank appearance. Recommended for your hall, lounge, dining room, kitchen and bedroom. Also, it comes with a 15 year warranty for your peace of mind. Available to take away from stores that stock laminate flooring.